There are many ways to define mindfulness. 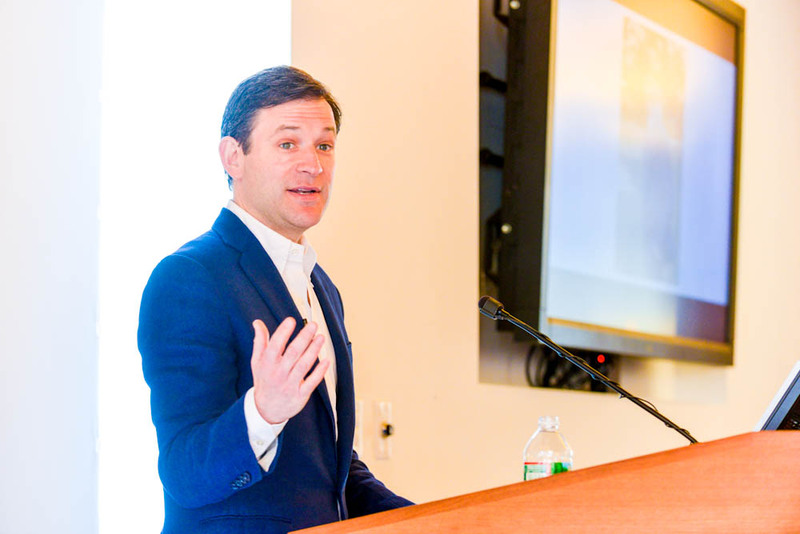 Dan Harris speaking at Dana-Farber about the importance of mindfulness. In a recent talk given at Dana-Farber, ABC news correspondent Dan Harris said mindfulness is the “ability to know what’s happening in your head right now without getting carried away by it.” Patricia Arcari, PhD, RN, of Dana-Farber’s Zakim Center for Integrative Therapies, descibes it as paying attention and being fully aware of what you’re doing in the present moment. Definitions aside, mindfulness and meditation have proven to be powerful tools to help people through difficult circumstances. The practices are ancient but the research is relatively new – and findings suggest mindfulness and meditation can reduce stress, pain and improve focus, among other benefits. The power of mindfulness to improve psychological well-being and lower stress levels makes it especially promising as a complementary therapy for cancer patients. To see the most benefit from mindfulness, Arcari says it is important for patients to remember two key ingredients: awareness and appreciation. Awareness, Arcari explains, can be as simple as bringing attention to your breath. You can also pay attention to the experience of basic happiness in everyday life – “the warmth of the sun, what the moon looks like, the natural world around us.” Arcari recommends trying to bring this awareness to everyday tasks: brush your teeth or take a shower mindfully, or experiment with eating a snack slowly and mindfully. Mindfulness is also about being aware when the mind is wandering or worrying, and gently guiding your awareness back to the present moment and task at hand. Appreciation is a natural byproduct of mindfulness; it’s a quality that arises when we notice and are truly present with things just as they are, Arcari says. Through mindfulness, you can nurture a sense of appreciation for basic things –a warm shower or a meal prepared by a loved one. You can also reflect and appreciate caregivers, family and friends, and relationships at Dana-Farber. For more information and resources on mindfulness and meditation, the Zakim Center for Integrative Therapies offers programs on Mind-Body Basics and Mindfulness Meditation.